Valentino Rossi has just completed his first laps on board Ducati’s factory GP11 machine at the Valencia circuit in Spain. After a lengthy delay caused by early rain, the nine-times world champion took to the track shortly before 12.30pm on a plain black Desmosedici machine emblazoned with his trademark number 46 on the fairing. Rossi was also wearing a special AGV with question mark logo on the top. Rossi emerged from the Ducati garage in front of the world’s media, many who had waited for up to two hours to get a prime position for when the nine-times world champion threw his leg over the Ducati for the first time. A large crowd that had gathered in the Valencia grandstand overlooking the pitlane gave Rossi a rapturous reception as he left to complete his first shakedown on the GP11 machine. 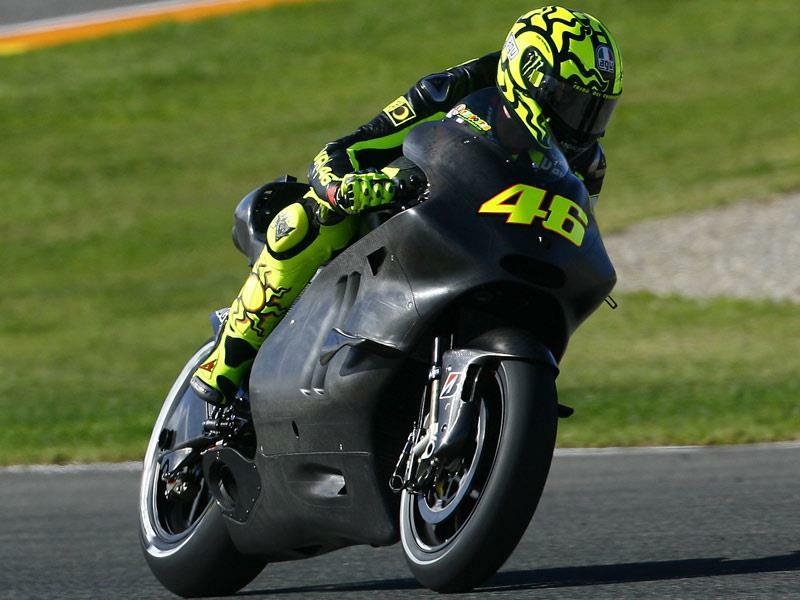 Rossi has three different spec bikes at his disposal for this week’s two-day test. One is the Big Bang GP10 that Casey Stoner campaigned last season. He also has a revised 2011 Big Bang engine and a new 2011 Screamer motor to evaluate. He set a best time of 1.37.329 in his initial run in sunny, cloudy and blustery conditions. 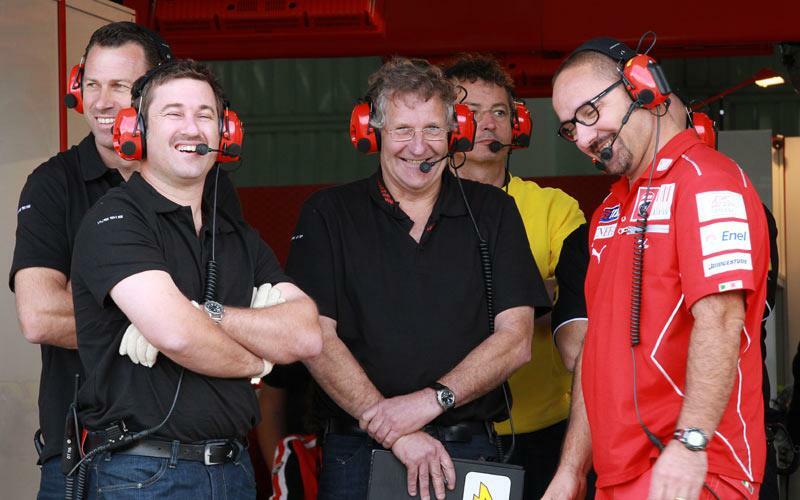 When he came back into the pits he was immediately swamped by an army of Ducati engineers and his crew, including Ducati technical guru Filippo Preziosi. 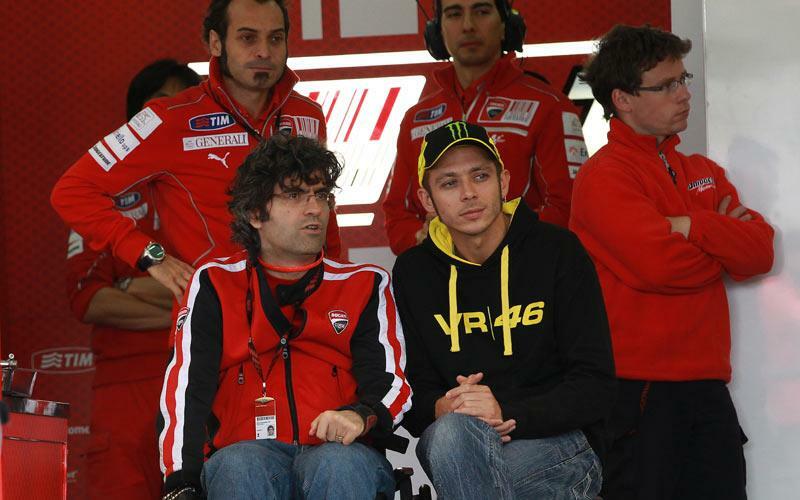 Rossi joins Ducati after a successful seven-year stint with Yamaha in which he won four world titles and 46 races. Only Rossi and fellow Italian Loris Capirossi have completed laps so far, with Ducati test rider Franco Battaini also completing a couple of exploratory laps.